Have you ever taken a minute to think of how many tasks you’d be able to accomplish without involving your hands? If you’re an angler, chances are you use your hands for all tasks. You need them to cast, attach the bait, retrieve the fish, row the boat, operate the fish finder and so forth. This is why it’s important to ensure your hands are always protected. And what better way to do so than by investing in the best fishing gloves? No matter your style of fishing, the table below is sure to help you find a pair that’s suitable for you. So, be sure to take a sneak peek. Rapala is perhaps one of the best-known brands when it comes to the creation of marine and fishing gear. So does their glove pair live up to the standards set by this brand? Well, the Rapala seems to stand tall among the best. First off, it boasts a latex coating which is pretty grippy. As you know, this grip can come in handy when one needs to handle a slippery fish. What’s more? The latex coating boasts the protection you need when faced with a hard-fighting fish. Indeed, this material is hard enough to prevent any injuries that may occur due to the gill plates, teeth or the impact of the dorsal fins. Moving on, the Rapala is durably made and, therefore, can be used for saltwater fishing with no major qualms. Yet it is still machine washable and capable of lasting long provided it’s met with the right kind of service. On the flipside, though, we find that it’s a bit too rigid and bulky and shouldn’t, therefore, be used as a filleting glove. 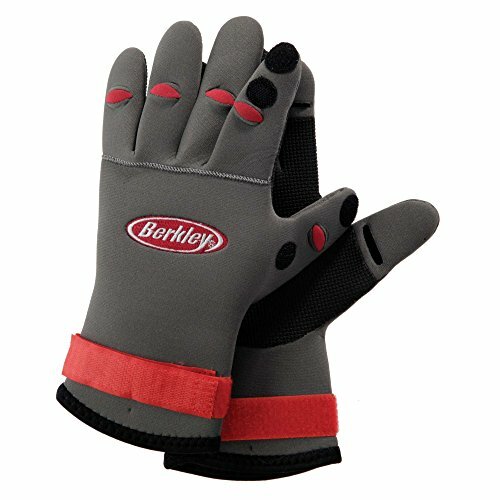 Ranking highly on this latest fishing gloves review is the Berkley pair of gloves. Known for its incredible texture and good looks, the pair stands out as a popular bet for all kinds of anglers. Right off the bat, the gloves are pretty heavy-duty which means they can be used to tackle even the toughest of all saltwater monsters. So, if you don’t like the idea of touching live fish, these gloves are a must-have. They are grippy and safe at the same time. Most importantly, there are comfortable and flexible to use at all times. Our analysis, however, reveals that these gloves are best suited for handling small and medium-sized fish. They, however, look a bit delicate for taming large fish such as Barracuda or sharks. Therefore, we’d recommend them for small-scale fishing expeditions. You can even keep them for emergencies. They particularly come in handy when dealing with aggressive catfish. You simply grab the fish and get a perfect grip of it which is unlike when you’d try to handle them with your bare hands. There are so many fishing gloves on the markets but only a few of them seem to get the basics right. The Ice Bay pair of gloves is particularly different from the rest. These high-end gloves are pretty tough and durably made. For that reason, they can easily be used for taming large fish species including sharks. Further, the gloves are waterproof meaning you can use them in all conditions and weather patterns with no worries absolutely. A closer look at the surface of the Ice Bay Glacier Glove reveals that they’re made from 2MM fleece lined neoprene. 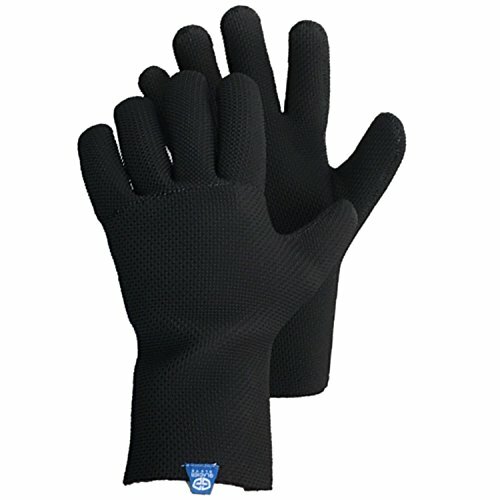 This is a handy texture that adds onto the grip besides making this pair of gloves quite long-lasting. Last but not least, the Ice Bay gloves are expertly designed to provide a seamless palm design. And unlike the rest, these are blind stitched and glued completing a smooth design, perfect for everyday use. Lastly, the sharkskin texture of this glove comes in handy in providing you with a handy grip. That complements the palm design in providing a no snags kind of design that can be relied on at all times. 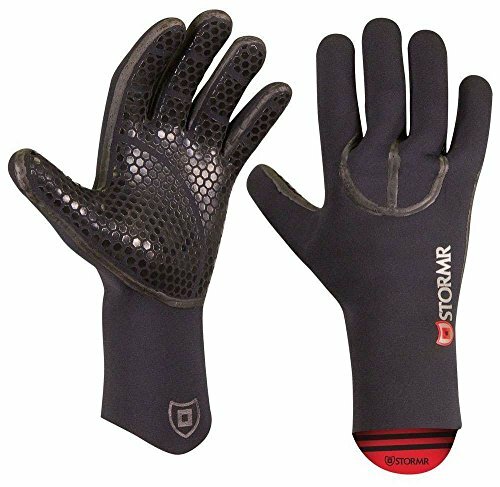 Few fishing gloves can rival the kind of value Stomr gloves present you with. Made in the USA, this pair boasts a patented design that’s meant to stand the test of time. The gloves are water-resistant and they do a stellar job of beading the water right off. Best of all, the pair boasts an extended wrist which provides you with an enhanced surface for grabbing fish and subduing it. You also get a rip-resistant design which comes complete with high-stress points. Actually, a closer look at this pair reveals that it has the tips finished in Kevlar. That alone confirms the fact that these gloves have the added layer of security you need at all times. So, indeed, this is a pair that you can bank on whenever you need to invest in something that’s guaranteed to stand the test of time. 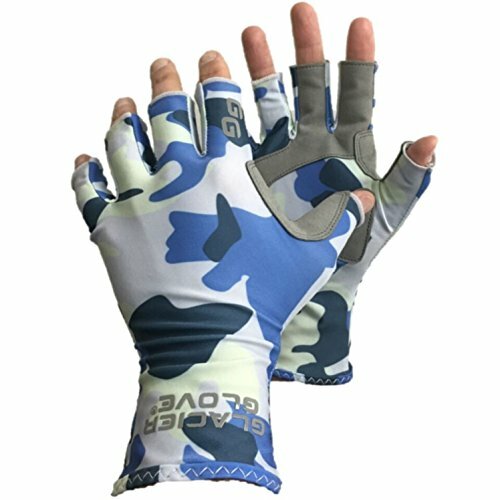 Available in blue camo and gray, these gloves boast an award-winning design. They are indeed designed to be handy, making it extremely easy to handle all kinds of fish when fishing. They, however, seem pretty delicate and for that reason, we’d recommend against using them to tame large, wild fish. That said, the Islamorada pair of gloves boasts a UPF 50+ level of sun protection. This makes them ideal for all-day use even in the glaring sunlight. The fingertips are exposed leaving you with a bit more tactile flexibility. And that’s alongside the fact that you get a 4-way stretch fabric that’s pretty comfortable to fit. Generally, the material is made from a quick-drying fabric that’s also breathable. As such, the pair is generally handy to use even if you’re one of the busiest anglers in the world. You simply need to put them to the right use and you’ll be sure to enjoy your fishing experience all day. The only caveat from us is that these would be best used for small-scale fishing in rivers, ponds, and lakes. Searching for the best fishing gloves for men and women? This unisex pair of adventure gloves from The Fishing Tree is worth investigating. To begin with, the pair boasts a reliable UV coating which makes it resistant to fading even after long hours of use in direct sunlight. The good thing with this UV protection is that it is expertly woven into the fabric rather than added on the surface. Therefore, this UV protective layer doesn’t diminish or wear off when the glove is wet or used for a long time. Besides that, the Fishing Tree pair of gloves is comfortable to use. You can fully rely on it to operate with absolutely no worries about calluses or even blisters. What’s more? The pair is machine-washable meaning that it can be fully relied on for the long-haul. That’s in addition to the fact that it’s highly breathable, quick drying and pretty light in weight. What if you could get a pair of gloves that doubles up as a fingerless one? The Pro Angler Glacier Glove is probably one of the rarest fishing glove designs on the markets. 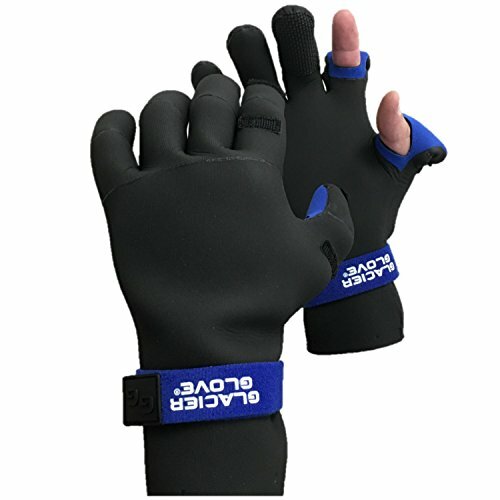 The pair can either be used as a full cover glove or a fingerless one depending on the existing demands or weather patterns. For instance, you can use it as a full cover glove when it’s pretty cold. You still can use it as a fingerless pair of gloves in summer and particularly when you need an enhanced grip. 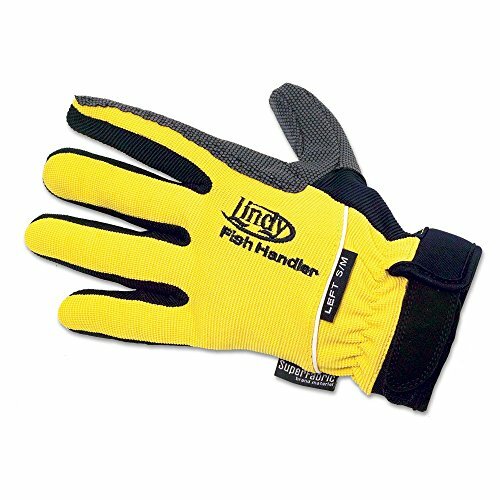 Generally, this fishing glove comes with a 2MM fleece lined neoprene which provides you with an enhanced grip. And the icing on the cake is that you end up with a seamless palm design which, further, enhances your convenience. So, if comfort is your craving this is the right kind of pair to go for. Likewise, if you’re after protection and some warmth, you still can bank on it. In others words, this is a rare breed of gloves as it provides you with a wide raft of adjustability options. On the flipside, though, that unique attribute also makes this pair of gloves a bit cumbersome to use. This multi-colored pair of gloves is not only good looking but also pretty handy. Its palm surface boasts an award-winning non-grip construction. That’s pretty much all one needs to tame even the most aggressive of all fish species. 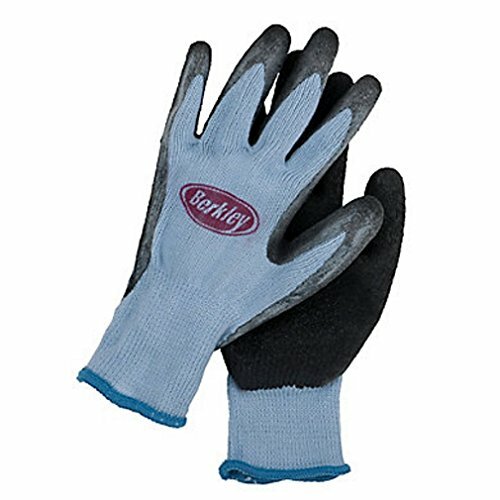 Moving on, the Berkley is generally a heavy-duty pair of gloves and yet flexible at the same time. For that reason, we’d recommend it for both ocean fishing and river/lake expeditions. Its heavy-duty design makes it a perfect bet for fishing under extremely cold conditions. Therefore, it would come in handy even in ice fishing assignments. 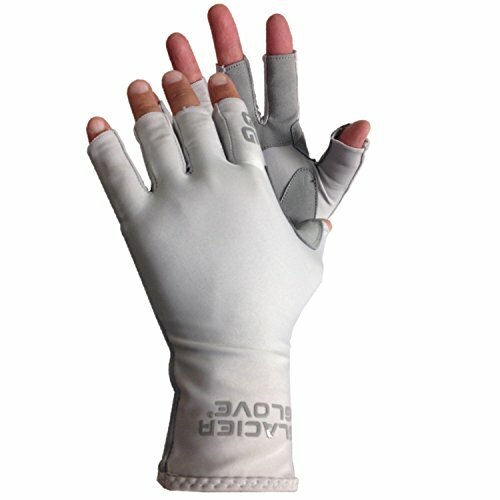 The Berkley’s uniquely designed thumb surface further provides you with a great control over your hand movement. This, further, goes a long way in enhancing your user experience. Besides that, this pair spots a secure Velcro wrist closure which not only fits nicely but also goes a long way to lock all the warmth in. Almost every task involved in a typical fishing trip is bound to damage your hands. We’re talking about the possibility of coming into contact with razor-like fill plates, needle-sharp fins, and even fish thrashing hooks. 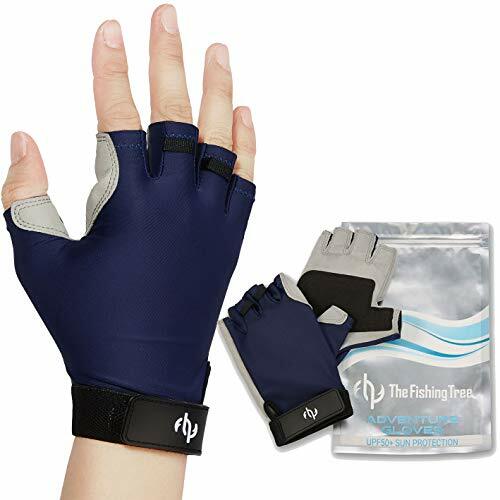 In such cases, only the best-made fishing gloves would keep you safe and that’s where the Lindy Fish Handler pair comes in. Designed with a high-quality material known as the SuperFabric, this pair combines armor technology with commercially available materials. This not only gives the pair a unique look but also provides you with a safe grip that you can use to comfortably handle slippery fish. And the best part about this material is that it is designed to be odor resistant. As such, it doesn’t accumulate all manner of odors over time and that makes it quite practical for long-term use. Besides that, it’s machine-washable and that makes it extremely easy to clean and maintain. In fact, you’ll realize that you’ll have a pretty easy time in filleting and unhooking. So, if you’re after practicality and functionality, this is certainly something we think would be such an awesome find. The perfect glove doesn’t always have to come with all the bells and whistles. Indeed, it’s the little things that matter as far as perfection is concerned. In that regard, this Fingerless sun glove from Glacier Glove stands out as a sure bet for any quality-conscious shopper. To begin with, it has a UPF 50+ level of sun protection. That alone makes it a perfect bet for anyone looking to invest in reliability. Moving on, this glove comes with a lightweight material which besides being breathable is also pretty light in weight. For your ultimate comfort, you get a 40way stretch fabric which besides being easy to use is also quite comfortable for all-day wear. And the best part is that you get a partial synthetic leather palm which is quite functional. On the flipside, though, this isn’t the kind of glove to go for is you’re involved in ice fishing. Though durable, it isn’t heavily padded which means it’s susceptible to heat loss. Fishing can be a dangerous game sometimes. Whether you’re handling abrasive gear, wiring big pelagics or simply spending time under the sun, you should always protect your hands. Here are the most important factors to consider when shopping for a pair of gloves. Which option is best to go for? 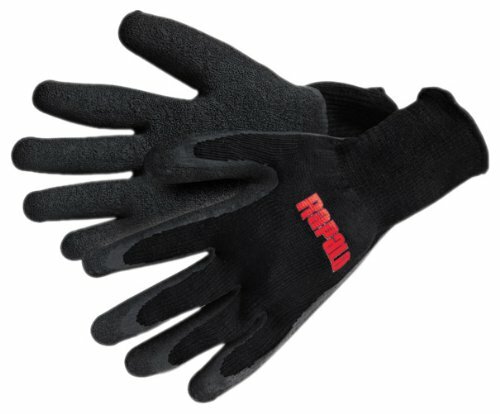 Well, we’d recommend the full gloves for fishing under extremely cold conditions. That’s because when the temperatures hit single-digits, you want to take advantage of insulation to keep going. Fingerless gloves, on the other hand, are loved by many for the flexibility. They are, however, not ideal for fishing in arctic cold conditions. That said, they still provide that much-needed UV protection to you, during summers. Other than the full vs. fingerless gloves, you may want to consider going for convertible gloves. Such gloves combine you with the benefits of being full and fingerless. Different kinds of materials have their merits and demerits. For instance, while some are heavy-duty, they may interfere with your ability to execute fine motoring skills. Basically, neoprene is the most popular kind of material used so far. T’s known for being grippy and water resistant. Unfortunately, though, it tends to lose heat really fast and is, therefore, not the best pick for cold weather fishing. For cold weather fishing, we’d suggest going for fleece. This is a special kind of material that’s pretty good at preserving hit. On the flipside, though, gloves made from fleece aren’t completely waterproof. With that in mind, we’d recommend settling for a composite pair of gloves. Ideally, it should have a neoprene palm but a fleece face and interior lining. Last but not least, you want to settle for a pair that’s duly protected from the harsh UV rays. Such a pair would be highly durable and dependable in different conditions even when used in saltwater conditions. UV protection, however, should be applied on the material level rather than on the surface. That’s the only way to ensure that this much-needed protection lasts long. The Ice Bay Glacier Glove seems like a really good pair for us. It’s not only good looking but also durable, warm and pretty flexible. Our editors found it to offer a slightly better value proposition than the other nine. 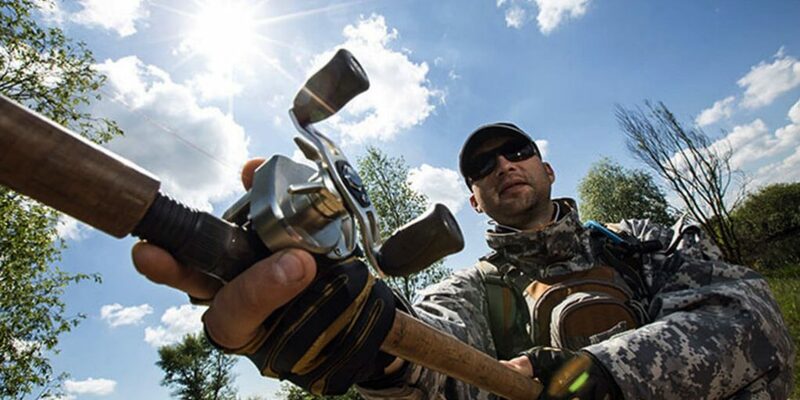 Your hands play an important role in your overall fishing experience. So, don’t compromise. Be sure to get yourself a good pair of gloves to protect yourself from accidental bites or bruises.